The Yorkshire Terrier and the Silky Terrier are often confused with each other. They can be indistinguishable to untrained eyes, both being toy terriers with lush coats. The similarity is not surprising, as the Silky Terrier is in fact an offspring of the Yorkshire Terrier and the Australian Terrier. But, look closer and you will see that they are indeed unique breeds. Yorkshire Terriers originated from the English city that shares its name. In the nineteenth century, they lived with the working class and hunted rats in coal mines and clothing mills. However, the dogs known as the Yorkies back then were twice the current normal size. To become the breed it is today, the Yorkshire Terrier has gone through many crossings, including with the Old English Black and Tan Terrier, the Paisley Terrier and the Clydesdale Terrier. Silky Terriers, also known as Australian Silky Terriers or Sydney Silky Terriers, were created in Australia. In the late 1800s, Yorkshire Terriers from the United Kingdom were crossed with Australian Terriers to improve their coat color, resulting in the Silky Terrier. The Yorkshire Terrier is a small toy terrier with a long, straight coat of bright steel blue and golden tan that is parted from the muzzle to the end of the tail. The long coat can grow longer than floor length and is often trimmed. The Yorkie's body seems rather square compared to the Silky's long proportions. Like the Yorkie, the Silky Terrier is small and has long, parted, straight, blue-and-tan coat, but the blue color can be silver blue, pigeon blue or slate blue. The coat falls below the body, but does not reach floor length. The Silky's body is also more low set compared to the Yorkie. The Silky Terrier is larger and heavier than the Yorkshire Terrier. The Silky weighs 8 to 10 lb. with shoulder height of 9 to 10 inches. The Yorkshire Terrier weighs about seven lb. with shoulder height of six to seven inches. 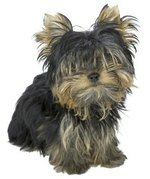 Both the Yorkie and the Silky travel well and are suitable for apartment living. Both breeds need social interaction and will suit owners who can devote time and attention to them. Their small size means that they need less exercise, with the Silky Terrier being the more energetic breed that will enjoy frequent play sessions and walks to the park. Both breeds have long coats and require daily brushing and frequent bathing. The Yorkshire Terrier might need more trimming due to the longer coat, but the Silky Terrier's coat is more likely to get into tangles. The hair on the tips of the Yorkie's ears need regular trimming to stop the ears from drooping under the hair's weight. Despite their lush coats, both breeds rarely shed.